Despite many team members have already started their vacation after the Sunday's Hungarian GP, smaller groups from the crews stayed at the Hungaroring to complete the second and last in-season testing programme during the 2018 championship campaign. The American Haas-Ferrari team announced earlier this month that it would miss the post-Hungarian GP test because it thinks it would hardly bring any benefit. Instead of on-track activities, the Günther Steiner-led squad will use the remaining days before the two-week-long factory shutdown to evaluate the data it collected over the last six weeks which saw a very intensive period of five race races. 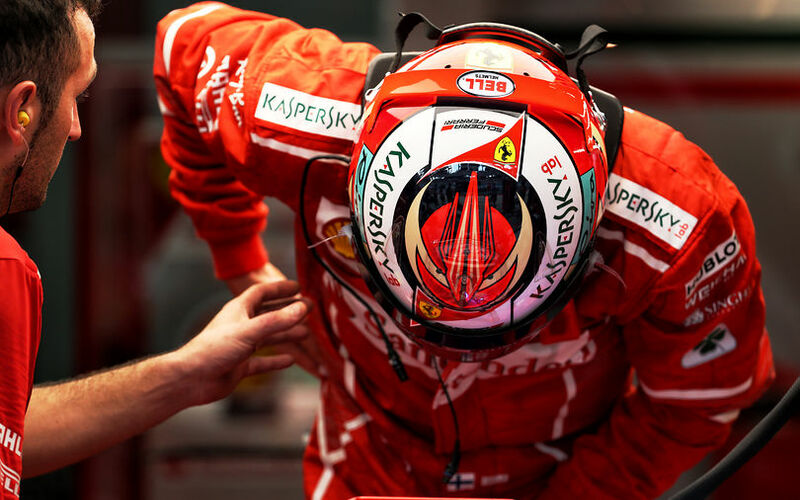 Ferrari's Kimi Räikkönen flew back to his residence in Switzerland with his wife and boy, but he will be back in action on Wednesday. Antonio Giovinazzi will be on track with the SF71H on the opening day of testing. Red Bull's race driver Daniel Ricciardo will be behind the wheel of the RB14 on Tuesday and the 23-year-old Blancpain GT series driver Jake Dennis will take over the driving duties on Wednesday. Nico Hülkenberg and Artem Markelov will share the driving duties at the Renault works team. Force India released its driver to vacation and gives its development drivers Nicholas Latifi and Nikita Mazepin chance to improve the car and themselves in the Formula One environment. McLaren will work with Formula Two driver Lando Norris on both testing days. Williams chose Oliver Rowland and Robert Kubica for its line-up. The Briton will drive on the first day and gives then the FW41 over to the Polish driver. Marcus Ericsson will drive for his team Sauber-Alfa Romeo on Tuesday while Antonio Giovinazzi will take over the driving duties on Wednesday. 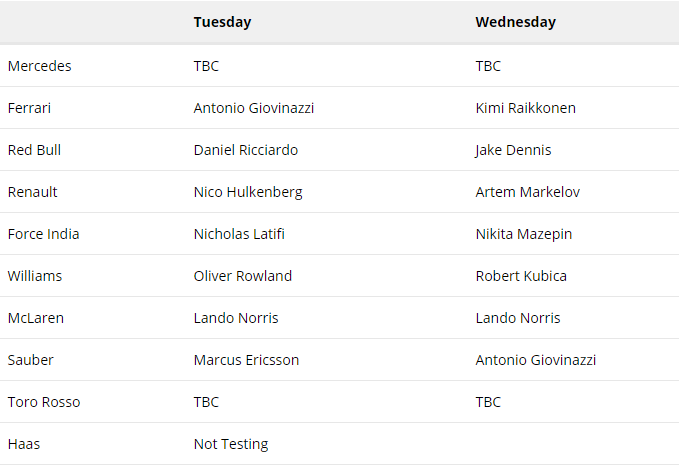 With driving for Ferrari on the first test day and for Sauber on the second day, Giovinazzi might be one of the two drivers who will hit the track on both days. Mercedes and Toro Rosso are yet to announce their driver line-up for the two-day-long testing programme. *update: in the meantime, Mercedes announced that George Russel will drive on both days while the duo of Brandon Hartely and Sean Geleal will complete Toro Rosso's second in-season testing.